I ran into a friend at a party the other night who was raving about a salad she had at a friend's house the night before. 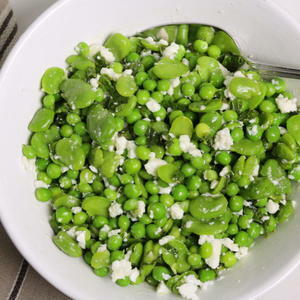 She explained to me the ingredients in detail... english peas, fava beans, french feta, lemon, olive oil and slivered mint. It sounded super yummy, so I thought I'd try and recreate it at home.